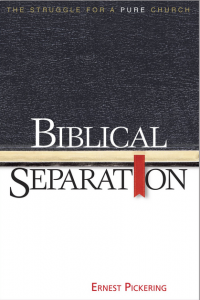 Regular Baptist Press has published a second edition of the late Dr. Ernest Pickering’s 1979 classic on separation. The new edition has updated some of the language as well as the footnoting to today’s style and information usage. Dr. Myron Houghton, senior professor and department chair of systematic theology at Faith Baptist Theological Seminary, has done a fine job of adding a chapter entitled, “Separation Issues since Ecumenical Evangelism in the 1970s.” Dr. Houghton also was instrumental in updating Dr. Pickering’s book, Charismatic Confusion (see review in the Dec 07 issue). Regular Baptist Press has done us all a great service in putting these books back into circulation. First, because this doesn’t seem to be a day when God’s people have a taste for issues of doctrine and especially those doctrines that can be divisive. These books put some important subjects back on the table. Second, because the issues of ecclesiastical polity and charismatic phenomena are as important today (and probably more so) as they have ever been. New issues having to do with music, liturgy, and church polity have only increased the need for clear lines of ecclesiastical separation, not lessened it. Third, because this book addresses the difficult topic of secondary separation which most of today’s writers, even within fundamental circles, won’t touch (a noted exception is Dr. McCune’s A Promise Unfulfilled—see review in the Feb 07 issue). Separation issues among brethren have become more difficult yet more important simply because the definition of “brother” has been widened beyond scriptural boundary due to today’s pro-ecumenical and anti-denominational attitude. Pickering’s original tact was to expose the reader to the historical roots of separation and bring those principles forward into his own generation. The updating of this edition and Houghton’s additional chapter again accomplish that purpose.